So I know we are a few weeks into 2019, but that doesn’t stop me from sharing my favorite books I read in 2018. These were my personal favorites, ones that really resonated with me! If you are looking for a good read to add to your list, these are it! Some I have mentioned before and some I have not! I feel like the first one I must talk about it All Your Perfects by Colleen Hoover which I have talked about MANY times on my blog. 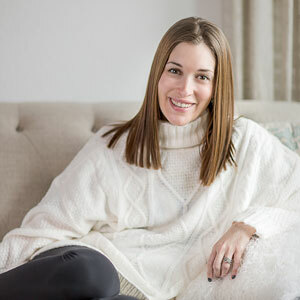 I think this story resonated with me personally because it talks about a couple going through fertility issues. As someone who went through fertility issues, I could understand her pain and where she was coming from. It’s also just a beautiful story about marriage, family, and relationships. So this next book, My Oxford Year, I read at the end of 2018 but it is still a favorite! It’s a book I know I will reread. It follows Ella as she moves and fulfills her lifelong dream of studying at Oxford and her relationship with Jamie. She is all set to return to a job in DC but will she? Educated a memoir by Tara Westover goes through her life having zero education to deciding at 17 she wanted a more educated life for herself. It’s captivating and fascinating and I could not put it down. One part The Bachelor one part The Hunger games you will LOVE The Selection Series if you haven’t read it yet. If you are a fan of either of those things this is for you! I loved it. It’s very young adult but still super fun! If you like politics at all you will love Charlotte Walsh Likes To Win. It’s about Charlotte running for Senate in a midterm election that is really important to the country. Hmmm sound familiar? I love Michelle Obama so I could not wait to read her book, Becoming. I really wanted to go when she was touring in Dallas but I just couldn’t make it work with our schedules. The book is so great and I love knowing more about her and their life before The White House. Tell Me Lies follows Lucy and Stephen’s relationship through college and after college and I love that it alternated in their points of view. Those are my favorite kinds of books to read! Have you ever been ghosted by someone and couldn’t let it go? Then the book, Ghosted is one you will enjoy! My Favorite Half Night Stand is another book I read later in the year but I loved it so much I knew I had to include it! It follows Millie and her group of guy friends as they decide to start online dating. But there’s a lot more to it than that. If you are interested in more of my book posts, check here! What was a favorite book you read in 2018? I haven’t heard of a lot of these! I’m looking for a new book to read once I finish Big Little Lies. I listened to Becoming through audible, it was incredible! Everyone has said Educated was really good, so I might read that one next! Educated was SO good. I listened to the audiobook and wow, what a story. I was amazed at what Tara was able to accomplish despite having no formal education as a child. I loved becoming by Michelle Obama, such a great read. I totally want to read educated now, it sounds like something I would enjoy! Tell me lies looks like a very good book to read and All Your Perfect. I have to start reading again. I used to read all the time just to relax myself before bed or when was bored. Wonderful list! I have a goal this year – to read one book per month at the very least! 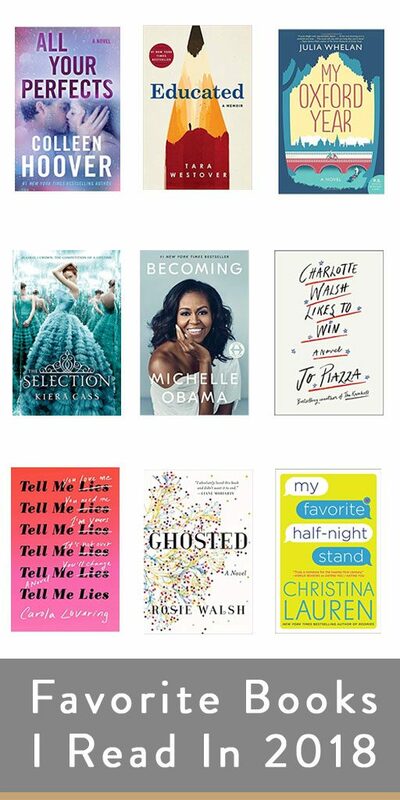 I have been eyeing Michelle Obama’s Becoming in your list! These all sound so good! I want to read Becoming but I am about #41 on the waitlist for the digital loan from my library. Maybe I’ll get to it this year. A few of the others seem like books I would enjoy, too, so I am adding them to my library wish list! Such a good list! I’m launching a 2019 Reading Challenge this week and will definitely be referring to this for suggestions. I actually got Becoming from my husband for Christmas and I can’t wait to read it! This is a great collection and I have only read 2 out of the list. They all sound good and will like to check them out. Educated, Ghosted, and Becoming sound just like what I am looking for! I love Michelle Obama so much as well (and certainly miss her in the WH) and have been meaning to pick this up! I think my favorite book I read was, “To The Moon” written by a survivor of the Moonie cult. It was really interesting. Thanks for this list, I’ve found a few I would like to check out. Becoming and Educated were both books I loved in 2018.
perfect timing! I was looking for new book suggestions to read as I found myself goign back to my old faves and not reaching for new material! Oh my gosh, All Your Perfects! And I read The Selection a few years ago and really enjoyed it, super interesting premise for a novel. Those all sound like great books. I haven’t been reading much lately and I really need to make some time to get back into reading. Thanks for sharing your list. It is nice to have some book recommendations. I’m only a few chapters into Michelle Obama’s Becoming and am loving it! Her writing style is warm, honest and insightful. The cover art of Selection just grabbed my attention right away, and now after reading your description of it, I am definitely putting this on my list. Sounds juicy! I just started reading again and last year, I finally read the entire Harry Potter series. I can’t believe I waited this long to read it. Order of the Phoenix is my favorite book in that series. I love that you include young adult because I do too and I get so many people telling me to mature up my tastes. But like, after reading a heavy or serious book sometimes you need some fluff! Plus they’re usually more exciting because it’s not about stuff im currently living through like bills and struggles and stuff! My fave books of 2018 were Dear Fahrenheit 451 by Annie Spence, My Mother Was Nuts by Penny Marshall- actually, i was really into female comedian biogs this year because i read Rhetta, Felicia Day, Tina Fey (again), Amy Poehler (again), Penny Marshall, Anna Faris, Lauren Graham (again), Tyra Banks and Anna Kendrick’s. Educated and Becoming are going in my list. Great reviews! Those books all sound great. You and i seem to have similar taste in books. I may need to read a couple of those from your list. I never heard of any of these books but they sound interesting. Great list of books! I can’t wait to check some of these out, and I appreciate that your list doesn’t look almost the same as everyone else’s. Such a great list! I’m adding a few of these to my to-read list. I really enjoyed Sorry to Disrupt the Peace and My Year of Rest and Relaxation. Becoming really resonated with me especially when she talks about her family. I have not heard of all the other books but they sound wonderful! Wow, such a great list of books, Now I gotta read it anyhow, its my goal too. thanks for sharing this awesome list of books. I love love love Michelle Obama! This is actually on my list to read. I find her just incredible. oh i have to check them out, i haven’t read any of them!